Fitness Find - Look what I made! A little consistent effort on my part and maybe, just maybe the fitness find of the day will be financial fitness and maybe a whole lot more. So I was thinking about fitness today. I have been disappointed because of my lack of progress in this area. It is perhaps because I don’t do it regularly. Then I began to think about the word and applying it to every area of my life. Of course, the first thing that I thought of was financial fitness. Now I have studied the Law of Attraction but I don’t think that it works this way. After my long bike ride, I stopped at Starbucks to get an ice coffee and relax before finishing the ride home. As always, I found a table with two chairs so that I could put my foot up. As I moved the chair, I saw a nickel staring up at me, heads up. It looked kind of old and I thought about leaving it alone, but my grandmother who used to collect coins taught me 2 things. One was that heads up is good luck and the other is that the older the coin the more likely it may be worth something. 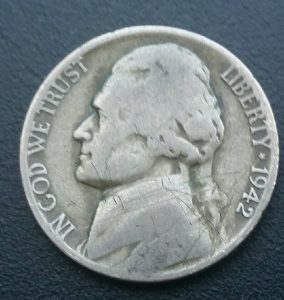 I grabbed it and it said 1942 which I instantly recognized as a wartime nickel. 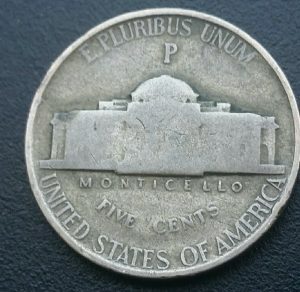 I flipped it over and it had the letter P above the Monticello. This means that this coin contains silver. I went online and found that it is worth 95 cents in its current condition. That’s almost 20 times its face value. This got me thinking…how many other things do we take at face value without exploring a little deeper? I think that I will explore and see what I can find. Perhaps my own value has been only “face value”. A little consistent effort on my part and maybe, just maybe the fitness find of the day will be financial fitness and maybe a whole lot more.